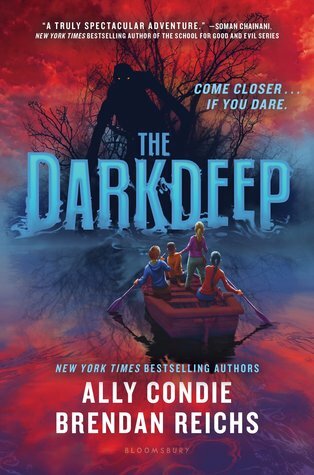 I recently received an Arc of The Darkdeep by Ally Condie and Brendan Reichs from NetGalley. I’m so happy I had the chance to read this awesome middle-grade story, and here are a few reasons you should consider adding it to your Fall reading list. When a bullying incident sends twelve-year-old Nico Holland over the edge of a cliff into the icy waters of Still Cove, where no one ever goes, friends Tyler and Ella – and even ‘cool kid’ Opal -rush to his rescue… only to discover an island hidden in the swirling mists below. Shrouded by dense trees and murky tides, the island appears uninhabited, although the kids can’t quite shake the feeling that something about it is off. Their suspicions grow when they stumble upon an abandoned houseboat with an array of curiosities inside: odd-looking weapons, unnerving portraits, maps to places they’ve never heard of, and a glass jar containing something completely unidentifiable. As the group delves deeper into the unknown, their discoveries – and their lives -begin to intertwine in weird and creepy ways. Something ancient has awakened… and it knows their wishes and dreams – and their darkest, most terrible secrets. Do they have what it takes to face the shadowy things that lurk within their own hearts? I love reading middle-grade novels. Not only are they quick reads, but they always help to pull me out of reading slumps. They’re a great pick me up after heavier reads as well (I’m looking at you Vox). The Percy Jackson books, and Furthermore by Tahereh Mafi are amazing not only because they tell a fun story but because they speak to something true about life. Those messages are important, no matter what age you read them at. In The Darkdeep, that message is about the fear of not living up to the expectations of your peers and family. That’s a pretty heavy subject that I felt was presented in a very relatable and hopeful way. The Darkdeep did get a little spooky at times, and I think I would have loved it when I was younger even more than I do now. The titular object (consciousness?) is somewhat like a boggart from Harry Potter and the Prisoner of Azkaban. Throughout the course of the story, it allows the primary characters to come face to face with fantastical beings they love and fear. It’s incredibly inspiring to see how they interact and deal with those encounters. The primary gang of kids in The Darkdeep reminded me a lot of The Loser’s Club from Stephen King’s IT. They demonstrated a deep level of friendship and a bond that can only really be formed through crazy childhood adventures. Both groups of kids also have to deal with a mysterious being that tries to infect their minds and destroy their town. Again, somewhat darker subject matter than I anticipated though that one’s on me since the word ‘dark’ is literally in the title. If you are a fan of middle-grade like me, or you know someone who is, I would definitely recommend The Darkdeep. I think it presents some very important messages, and told a really compelling and thought-provoking story that kids and parents could share. It will be on shelves October 2nd 2018. Middle grade is hard for me! Glad you enjoyed it! I haven’t tried those books!